Tickets for All Points East can be purchased here. 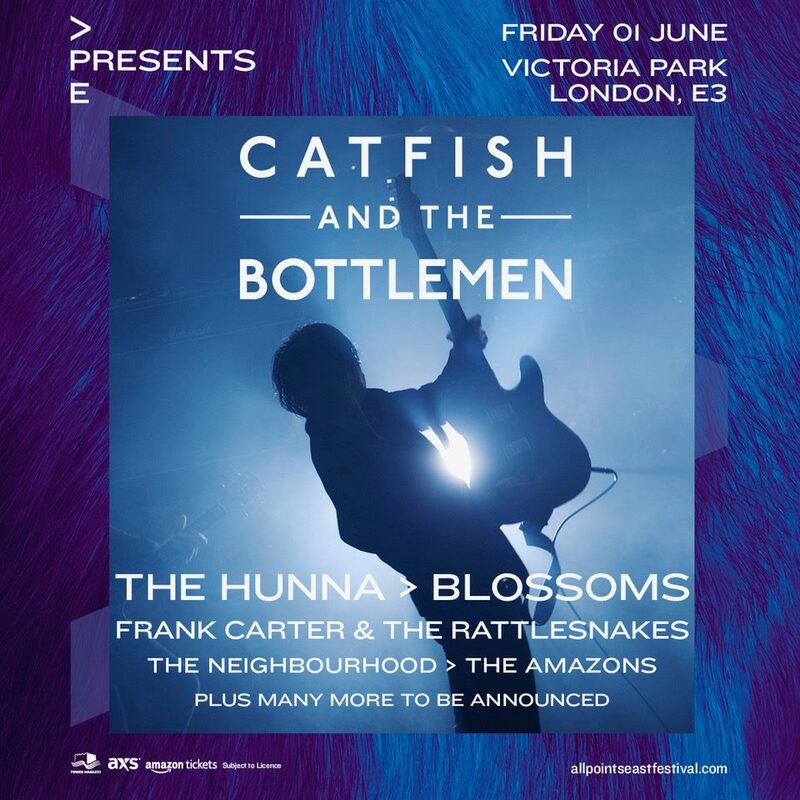 As part of this year’s All Points East Festival, Catfish And The Bottlemen headline a huge show in London’s Victoria Park on June 1st. APE have lined up a special day which includes a line up including The Amazons, Frank Carter and The Rattlesnakes, The Hunna, The Neighbourhood and Blossoms. Catfish and the Bottlemen’s apparent overnight success had actually been 7 years in the making. Having sold over 250,000 copies of their debut, 2014’s The Balcony, the pressure for their follow up was colossal. It’s been nearly two years since The Ride, their sophomore release, was unleashed to their adoring fans. The album instantly hooks you in with the song 7, with its catchy chorus and powerful guitar hooks. Next up is Twice and Soundcheck, where the band’s reflective lyrics soar over hefty guitar lines and captivating drums. The energy throughout the record is unmistakably distinct. It’s perhaps only on the song Glasgow where the band offer up a more subdued feeling, reminiscent of fan favourite Hourglass from the band’s debut. Off the back of The Ride’s success, the band have played their own sell-out show at the massive Wembley Arena, cementing their status as one of the UK’s biggest bands. When they descend on Victoria Park this June, they’ll be upping the stakes even more. Expect to hear early hits such as Kathleen and Cocoon expertly intertwined with material from the Ride, as their dedicated fans scream out the lyrics in delight. Joining the band at this unmissable event is a wide array of indie rock and punk rock talent. Four-piece Reading outfit The Amazons are set to enthral fans with their distinct brand of indie rock, which serves up euphoric chorus coupled with impassioned guitar licks. The Neighbourhood, perhaps best known for their beloved anthem Sweater Weather, will descend on Victoria Park with tracks lifted from their ground-breaking three LP’s. Although the band aren’t afraid to experiment with their sound, all their tracks convey an unmissable sense of heartbreak, hope and heartfelt honesty. Also joining the line-up are Blossoms who recently marked their return this April with their critically acclaimed second album Cool Like You. Their synth-led second album takes elements from their number one self-titled debut, while offering up a sound that’s accomplished and confident.